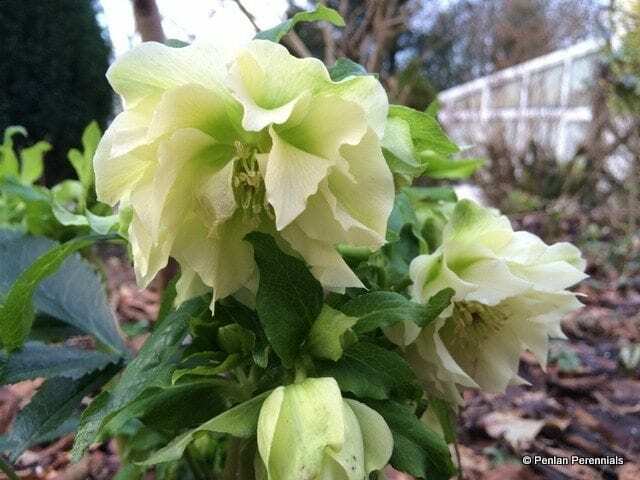 The fat shoots of hellebores, pushing through snow or heaps of woodland leaves, are a sure sign of a new growing year, appearing as they do when most self-respecting plants are still sensibly dormant beneath their protective winter mulch. Hellebores belong to the Ranunculaceae family and the genus consists of a fairly small number of species, about twenty, which are mainly found in scrubby or mature woodland in Europe and Western Asia. They prefer heavy, neutral to alkaline soils in dappled shade and because most of their growing and flowering occurs before the woodland canopy is fully opened in early summer, are well adapted to the woodland edge. Most Hellebores are hardy throughout the British Isles but the species are rarely seen in gardens due to their propensity to hybridise freely with each other and the fact that their flowers are often fairly plain and lacklustre in colour, size and habit. One beautiful exception is Helleborus thibetanus. Helleborus foetidus (the Stinking Hellebore) and Helleborus viridus are both native species, growing in large colonies on chalk soils in the wooded areas of Southern England. The stinking hellebore is not as bad as it sounds and grows well in woods around our nursery! Although the sap of all hellebores can be an irritant and most are poisonous if eaten, the plant does not smell unless crushed and the flowers actually have a pleasant scent if you get close enough without bruising or crushing the foliage. The ‘Wester Flisk’ form of Helleborus foetidus has good red flushed stems and the maroon edged flowers emerge continually for several spring weeks. It is best to buy these in flower as the reds can be very variable, being seed raised. The green hellebore, H. viridis, has rather insignificant flowers and the emerging foliage is often lost amongst the dog’s mercury (Mercurialis perennis) and bluebells (Hyacinthoides non-scripta). One species that is widely grown in gardens is Helleborus niger, rather optimistically called the Christmas rose, for it rarely flowers that early. The attractive white flowers, set off against dark green leathery foliage, always make it a tempting purchase when seen on nursery benches or in garden centres but it is difficult to grow well, requiring a rich, highly organic soil and lots of lime. New plants often perform well for a year or two before fading away when grown here in Wales. Helleborous argutifolius is, however, made of sterner stuff, despite its Mediterranean origins in Sardinia and Corsica. The largest of the species, its dramatic, spiny foliage sets off clusters of creamy, pale green flowers all spring and it remains resolute through snow and frost. Sometimes the number of flowers is so great it does cause the plants to droop a little. The majority of Hellebores grown in our gardens come from the Helleborus x hybridus group. This name changed a few years ago and you may still see plants being sold as Helleborus orientalis, although their origins are not oriental at all, coming as they do from Turkey and around the Black Sea. There are now several hundred named hybrids and these days, they come in green, yellow, pink, apricot, red, white, cream, purple and slate black. Sky blue is perhaps the only shade denied the hybridisers. Several are double flowered, others anemone centred and all flower on stout stems from mid-winter to mid-spring. There are many fine, vibrant shades and flowers are often spotted and mottled. They are best planted with lots of organic material and enjoy an annual mulch with leaf mould in the autumn. It is very important to remove the old leaves in late autumn or early winter so that the emerging flowers are seen at their best from Christmas on and the new bright green emerging leaves have room to grow. Once planted they should be left undisturbed as they resent being moved and will often stop flowering for two or three years, so it is important to place them correctly the first time! Put them somewhere that gets partial shade in hot summer weather and they will give you many years of pleasure. Well established clumps can be divided carefully in September, avoiding damage to the fleshy, fragile roots. Plant the new plants 45-60cm (18-24ins) apart in rich soil and water well until established. Seed must be collected and sown when it is fresh but will never come true to the original parent, unless it is one of the species, although it is always exciting to see what new colours or spot pattern might emerge. 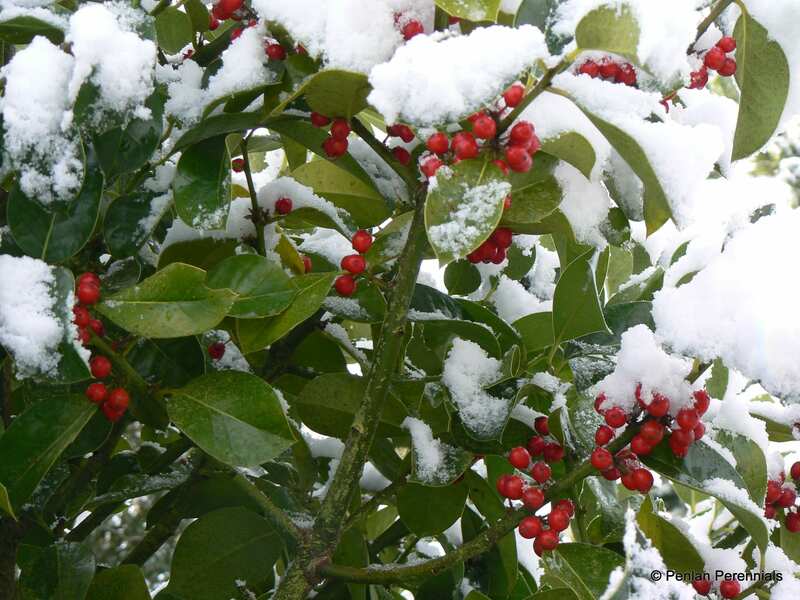 Seed requires a cold period to germinate so leave it outside during the winter. I find it much easier to look for seedlings around the parent plant and carefully lift and pot them in spring. It can take two or three years before seedlings are large enough to flower, so you have to be patient. If at all possible purchase Hellebores in flower so that you can see exactly what you are getting. We are very lucky to have a breeder of Hellebores on our doorstep here in West Wales. Richard Bramley, of Farmyard Nurseries in Llandysul, produces thousands of plants a year in a huge range of colours and forms, many carefully selected from hand-pollinated crosses. It really worth the while selecting them and placing them in their new home because at this time of year hellebores are heaven. First published in Welsh Country Living.